All 2002 2003 2004 and 2005 Ford T-birds came with a soft top. Standard and only color for all 2002 and 2003 Ford Thunderbird soft tops is Black, even on the special Editions. In 2004, Ford added 3 new colors of soft tops depending on color of car. "Sand" (light oak) was available on all the stock colors - Black, red, silver, ice blue, vintage mint green, and merlot. The Sand softtop only came if the Sand interior package option was ordered and was the only color available if that package was ordered. "Merlot" was available on the black and Merlot cars during the 2nd half of the production year. "Light Ash" was the only color available on the special edition Pacific Coast Roadster. "Black" was still the standard color softtop for the stock colors. Ford added the Steel Blue softtop, paired with the steel blue partial interior for the Steel blue and Platinum Silver body colors. The 2005 special edition, came with a "Medium Light Stone" soft top only. The Cashmere 05 has a Medium Light Stone Lining. All OEM Softtops are cloth - the black is a Haartz "Landmark" fabric, the colored Tops use "Twillfast" by Haartz. Landmark: A three ply composite made of an acrylic square weave outer fabric, an elastomeric inner layer and a polyester/cotton lining fabric. Twillfast JX: A three ply composite made of acrylic twill weave outer fabric, an elastomeric inner layer and a polyester/cotton lining fabric. Although the fabric does not promote mildew growth by itself, mildew may develop on dirt and other foreign substances that are not removed. This is especially true in warm, humid, dark environments. A program of keeping the fabric clean through regular washings, BEFORE it gets dirty, will enhance the life and beauty of the acrylic and make successive cleaning easier. The Haartz Corporation recommends using RAGGTOPP™ Cleaner and RAGGTOPP™ Protectant (available from Wolfsteins Pro-Series at tel: 800-377-4700, fax: 770-395-1353, e-mail: info@wolfsteins.com). Hand washing in shade or partial shade, not direct sunlight, is best. DO NOT USE DETERGENT. Bird and tree droppings, as well as other loose particle soils, should be removed immediately. Vacuum with a brush attachment and rinse thoroughly with water to remove loose particle soils. This will also prevent the soils from being redeposited during the cleaning process. Once the fabric has been rinsed thoroughly, spray RAGGTOPP™ Cleaner evenly over the entire surface while still wet. Allow the cleaner to soak for 10 to 20 minutes and then scrub lightly with a soft nylon brush or terry cloth rag. Rinse thoroughly, preferably until no remaining soap foam is observed. Additional cleanings may be required. It is best to determine the need for additional cleanings after the fabric has dried completely. For more stubborn cases, mix a solution of no more than 1/2 cup (4 oz.) bleach and 1/4 cup (2 oz.) RAGGTOPP™ Cleaner per gallon of water, soak for approximately 20 minutes and scrub lightly as indicated above. (Excessive soaking with the bleach solution can deteriorate seam threads.) Rinse thoroughly to prevent streaking on painted and chrome surfaces. Several cleanings may be necessary. Additional info on cleaning your softtop: Found in a marine catalog, a product made by Camco called Armada "Mighty Brite"; it's a non-toxic, biodegradable, mildew stain remover (which contains no bleach). A member on Thunderbirdnest forum found that it got out the stains that even the above method did not entirely remove. 1. One caution is to never let the header slam against the top of the windshield trim when putting the top up. 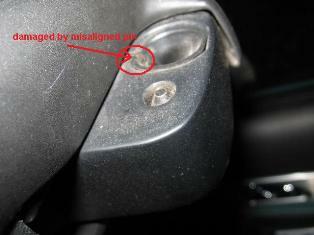 You risk breaking the J-hook or the alignment pin or the receptacle. My hints: I usually allow the top to come to just out of closing distance and put my hand up to slow it down, then open the handle (it should have been closed after you put the top down). Then make sure the J-hooks & alignment pins align with their holes. (not doing so puts stress on the bars and pins and the top may not close all the way, creating a whistling sound when you're traveling down the road). Then I lower the top the rest of the way to the windshield header and close the handle. 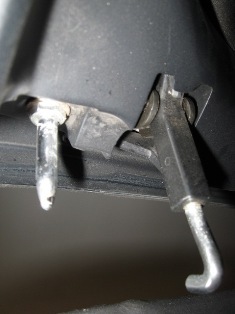 If the handle glides into position easily, the pins and J-hooks are in the correct position. If it offers resistance to closing, then double check the J-hook and pin alignment. Do not force the handle closed. Sometimes I need to push on the outside edge of the top to get the passenger side pin & J-hook to line-up correctly. I only need to do this on my 02; the 05 top alignment is perfect. I've never had resistance when closing the handle unless the car is on an uneven surface.## Dot See photos below for additional help. 2. 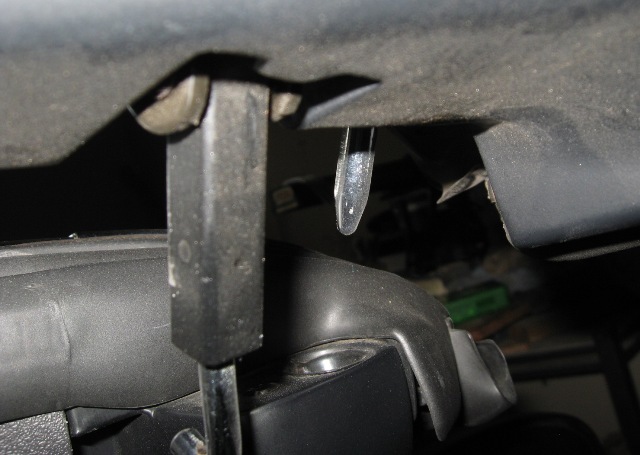 Also, the car needs to be on flat ground to keep any twist (flex) in the body from affecting the line-up of the pins and J-hooks when putting the top up. Flex can cause the pins to not align correctly in the two corners and put tension on the bars. Always make sure the pins are lining up with the holes before closing the handle. Otherwise you also risk breaking off the pins. The pin hole (receptacle) is sloped to help you get the pins into the holes but sometimes the pins might be hitting the outside of that receptacle if the body has flexed the softtop frame or softtop is not aligned correctly. J-Hooks and pins are chromed on the 02. The J-hook is black and the pins are chromed on the 05. Not sure on the 03s and 04s. This is the left or driver's side pin and J-hook This is the right or passenger side J-hook and pin. This is what your pin receptacle looks like. 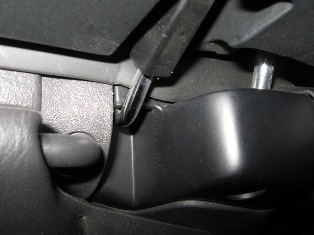 The above is minor damage caused by trying to force close the handle when pin is not aligned correctly. This is when you need to adjust the top corner of softtop with your hand.. Sometimes you need to get out of car to do it.